I testify at redistricting hearing in Greenfield, Mass. about how the state can avoid prison-based gerrymandering in this round of redistricting. I testified last night in Greenfield, Mass. before the Joint Special Joint Committee on Redistricting about how the state can avoid prison-based gerrymandering. 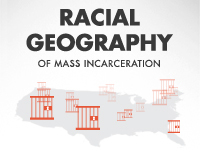 The Census Bureau may be counting incarcerated people as if they were residents of the census blocks that contain correctional facilities, and not as residents of their legal addresses, but the state can take the prison populations in to account in order to reduce if not eliminate the harm of prison-based gerrymandering. In my testimony, I review two examples of how prison-based gerrymandering distorted democracy in state house districts drawn in 2002, and then discuss three things the state can do while drawing the districts to greatly reduce if not eliminate the harm of prison-based gerrymandering. Included in my testimony is a list of the census blocks that contain correctional facilities in the state so those populations can be taken in to account when drawing the lines. Two weeks ago, Brenda Wright of Demos testified before the committee, and in 3 weeks on June 21, the co-chairs of the joint committee will join with advocates at the Black Community Losing Power: Counting Inmates In the Wrong Place forum in Mattapan, MA at 5:15pm. See you there! The Prison Policy Initiative and Demos submitted testimony to the MA Special Joint Committee on Redistricting urging them mitigate the harm of prison-based gerrymandering. We’ve released a new video to support the campaign to end prison-based gerrymandering in Massachusetts.